Spring cleaning in the winter. Time once again to use up all the food that’s been around almost too long. Below, in glorious detail that most of you will care not to know, is one way to clean house. Hopefully it won’t clean out your intestines at the same time. You may substitute fresher ingredients, most likely with better results. The carrots had been in the crisper for weeks, but not months (still have a few standards). They were slightly on their way to being dehydrated carrots, but no sign of extraneous growth. Incidentally, my crisper does a pretty good job. You may want to rethink with a lesser crisper. The wife keeps buying these against futile objections. So there’s some pressure to find a use for them, other than providing a bed for those extraneous things to grow on. I’ve been caught twice throwing them in the backyard for the wild rabbits to eat. Don’t want to be caught a third time. Use ‘em or lose ‘em. Use ‘em or lose ‘em, too. These had been providing company for the carrots, but were newer additions to the crisper. Even when new, these were some of the most beat up stalks of giant celery that ever made it into the shopping cart. That’s one thing about my local ALDI, they sometimes have some really great produce prices, but appearance can be sacrificed. These were the last 3 from a 10 pound bag purchased from ALDI for $1.70 (couldn’t resist that price). Ten pounds of potatoes in this house is close to a decade’s supply. The last 10 pounds I had eventually sprouted, forming a mass of green growth that looked strangely like Audrey II. Wanting to avoid a similar fate of being eaten by a plant, instead of eating a plant, it was time these found their way into a recipe. The beef was the Muse for this inspired recipe. Unfortunately, even though this is just a refrigerator top freezer, when packed tightly it can hold more food than we can keep up with. Naturally then, the older items tend to get pushed to the back and overlooked for too too long. So it was time for one tightly wrapped, but slightly freezer burned package (along with some companion packages) to find their way to the front of the freezer and eventually out into a dish. This also clears the way for next year’s inspiration. This was still within the “best by” date. But with about 6 cans on the shelf, it was time to start paring stock. The holidays are over, so there’s no more need for green bean casserole. This was an orphan can left over from two years ago when onions were really inexpensive and French onion soup found it’s way to the dining room table several times. This adds great taste to soups and stews. All I need to do is make more soups and stews, because I’m sure it goes bad after a while. This was the last bit of a bottle so it was all just dumped in the stew. It adds some nice flavor and I have a really big container of it. This also adds some nice flavor, but tends to be forgotten until the sauce under the cap dries so hard that a mini air wrench is needed to pry the goodness from the bottle. Cook the ground beef in the olive oil in the Dutch oven on the stove top over medium heat. Add salt, pepper and basil while cooking the beef. When the meat is cooked, add potatoes, carrots and celery. Stir it all together, cooking the vegetables with the meat for a few minutes. Stir in the beef broth, onions, vegetable base, Worcestershire sauce and cumin. Raise the heat to bring the pot to a simmer. 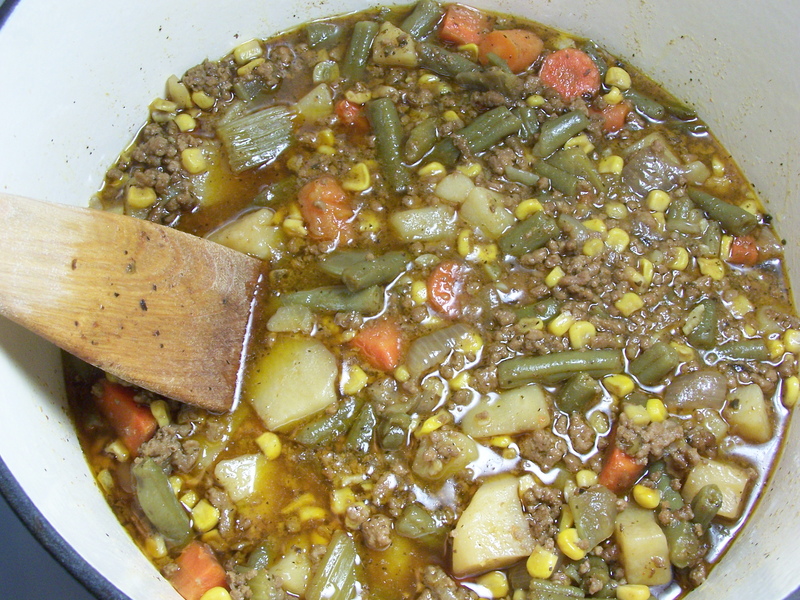 Once simmering, cover and lower heat to maintain the simmer. Cook until the potatoes and vegetables are almost done (not hard, but not very soft either). Stir in the corn, green beans and garlic. Bring back to a simmer. Cover and cook until the vegetables are fully cooked. This entry was posted on 01/21/2012 at 12:38 and is filed under Recipes, Recipes, food, cooking and related items. You can follow any responses to this entry through the RSS 2.0 feed. You can leave a response, or trackback from your own site.